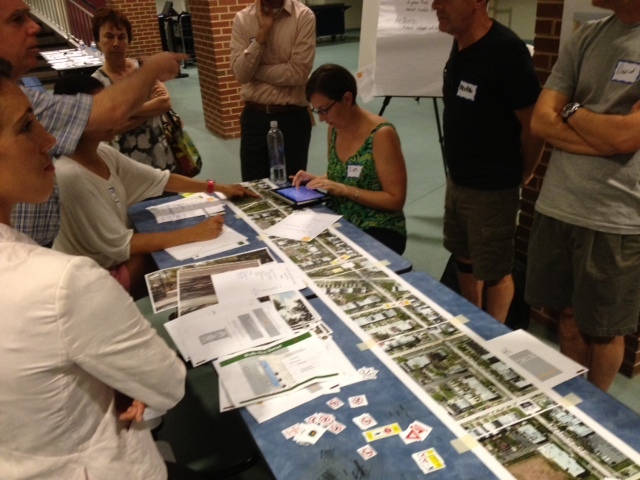 Residents discuss traffic calming strategies for 17th Street SE at the July 30 charrette meeting. Each group gathered around a map of their portion of the corridor and used cut-outs and markers to suggest improvements. For example, you could place a cut-out of a stop sign on an intersection in need of a signal. After a lengthy discussion about whether 17th Street SE should be one way or two-way, the group coalesced around keeping the corridor one way but reducing it to one lane, adding a bike lane and preserving both sides of on street parking. This change would essentially make 17th Street SE look like 15th Street SE and would certainly slow traffic down and make 17th Street a less attractive route for commuters. In the short-term, such a change would probably reduce air quality, though traffic volume over the long-term would likely decrease. The idea of converting 17th Street SE from one-way to two-way received mixed reviews from the group. Proponents felt that two-way traffic would reduce speeds and volume along the corridor and could be accomplished while maintaining the existing level of on-street parking. Opponents of two-way conversion voiced concerns about pedestrian safety (looking both ways instead of one way) and about increasing northbound truck traffic. Trucks currently access 17th Street SE at Barney Circle but are forced to turn right at Potomac Avenue SE. Short-term recommendations included adding a stop sign at 17th and D Street SE, adding pedestrian markings and crossings at 17th & C Street SE and 17th & G Street SE and re-timing the stop lights to slow traffic down. The group also liked the idea of adding “bulbouts” at 17th and Massachusetts Ave. SE, 17th and E Street SE and 17th and Potomac Avenue SE. Speed cameras for the corridor were recommended by the group. ANC 6B has requested that MPD place a speed camera somewhere along the 17th Street SE corridor. Group members suggested 17th and Mass Ave., 17th and Potomac Ave. and 17th and Barney Circle as potential camera locations. The group recommended truck restrictions based on weight for the entire corridor. With the 11th Street bridge project now complete, we asked DDOT representatives if they could put a temporary sign on I-295 encouraging truck traffic to use the bridge instead of exiting on East Capitol Street. To tackle noise, the group suggested removing the ineffective rumble strips on 17th Street SE and re-paving the entire stretch of road. Attendees also wanted to restrict tour/commuter bus traffic on 17th Street SE. The 19th Street SE group suggested two-way conversion from East Capitol to Potomac Ave. and pedestrian crossings at 19th & Burke and 19th & C Streets SE. A big thanks to everyone who was able to attend the meeting. And a special thanks to Hill East residents Denise and Liz for taking notes and facilitating the conversation. Please share any comments and feedback below. If you missed Monday’s meeting, I hope to see you tonight (July 31), 6 pm – 8 pm at Pilgrim AME Church, 612 17th Street NE! This entry was posted on Tuesday, July 31st, 2012 at 8:01 am and is filed under 17th Street SE, 19th Street SE, Transportation. You can follow any responses to this entry through the RSS 2.0 feed. You can leave a response, or trackback from your own site. Thanks for sharing the notes! There is no way 17th street NE could ever be made one lane without serious problems at Benning Road. I still believe that two-way traffic everywhere possible is the smartest way to calm traffic. One-way streets will still be seen as traffic sewers, even if they’re one lane wide. People will just drive in the bike lanes to try to get around stopped traffic if there’s room. Hope it was a welcoming meeting. I would have loved to attend, but after the reception I received from Gladys Mack last time, I wouldn’t come back to a meeting in the neighborhood. She made it clear that “outsiders” are not welcomed there. IMGoph, it looks like Ms. Mack isn’t running again! Tom A.: Wonderful. Hopefully someone inclusive will take her place.